While it's possible to sample Germany's high-quality brews year-round, a handful of popular beer festivals take tasting to the next level in the spring and summer months. Here are a few of our favorites in Regensburg, Augsburg and Würzburg. Travelers who venture to Regensburg in April and May will find plenty to cheers to, thanks to three festivals that feature the frosty favorite, including the Regensburg Craft Beer Festival, which showcases the best of small-batch breweries. Designed to highlight and celebrate lesser-known beer producers, this free event offers plenty of samples, ensuring that travelers leave in high spirits. This event offers visitors a unique opportunity to explore the culture and flavors of beer in Regensburg with tourists and locals alike. From monastic breweries to up-and-coming ones, Bavarian Beer Days blends music, exhibitions, food, barley and hops into one of the city’s top festivals. Another popular Regensburg celebration, this festival dates back to the 10th century in honor of Germany’s top beverage. Travelers can attend for much of the fun and flavor found at Munich’s iconic Oktoberfest but with smaller crowds and lovely UNESCO World Heritage-listed scenery. Visitors who find themselves in the streets of Augsburg during the biannual Augsburger Plärrer are in for a serious treat. The two-week festival includes family friendly carnival rides, delicious German food (including regional Swabian delights), plus live music and fireworks. With upwards of a half a million annual attendees, this beer festival provides one of the best times and places to sample culture, tradition and beer all at once. Würzburg’s mid-July Kiliani Volksfest attracts attracts travelers from around the globe, as well as plenty of locals. Similar to the Augsburger Plärrer Beer Festival, Kiliani showcases German beers and offers travelers tented entertainment all over the festival grounds. 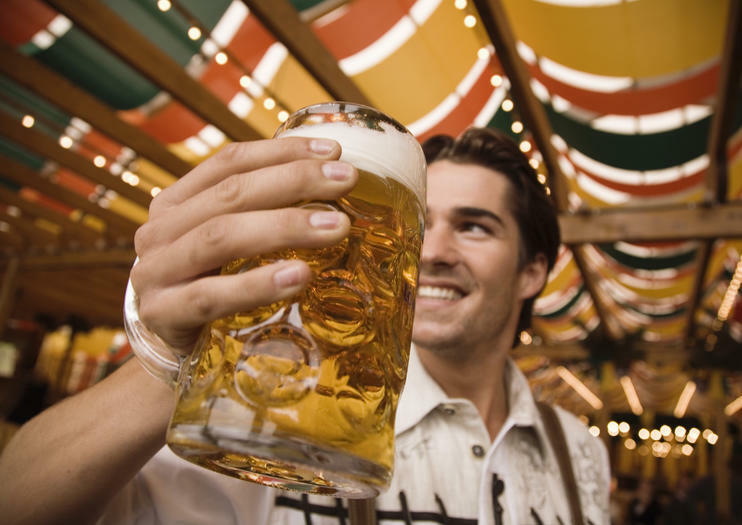 Kiliani Volksfest’s 1 million annual visitors solidify its status as one of the top brewery festivals in this beer-drinking nation.